BEIJING - Yuan Longping, known as the "Father of Hybrid Rice", said on Wednesday that he hopes that in 2020, when he turns 90, he can create a new version of hybrid rice yielding about 15 tons of rice per hectare. 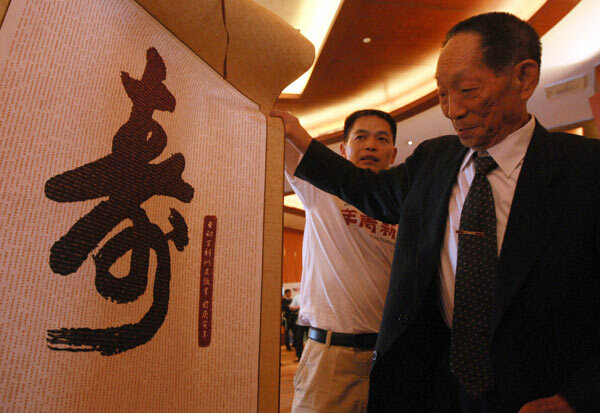 Yuan, a renowned agriculture scientist who celebrated his 80th birthday on Monday, said he now has two wishes, both concerning his life's work - the hybrid rice that he originally created in the 1970s. "First, I wish that by 2012, my team and I can complete the Phase-III super hybrid rice, which is expected to yield 13.5 tons of rice per hectare. I hope I can live another 10 years until 2020. By then the yield will be improved to 15 tons per hectare," Yuan said at the 21st Century Forum in Beijing. "Second, I wish that hybrid rice will be spread all around the world to solve the problems of hunger and ensure food security worldwide," he said. Hybrid rice is produced by crossbreeding different varieties of rice. The second-generation super hybrid, which was released commercially in 2006, can yield 9 tons of rice per hectare on average. Hybrid rice in China has significantly helped increase rice output and allowed 20 percent of the world's population to feed itself with just 7 percent of world's farmland, Yuan said at the forum. "The increase of rice output plays a key role in ensuring food security and reducing poverty worldwide, and the most effective experience in increasing rice output is China's work on hybrid rice," Yuan said. "We are fully prepared and willing to help other countries with food issues by growing hybrid rice," Yuan said. China is now planting 440 million mu, or 29 million hectares, of rice every year, with an average output capacity of 6.3 tons per hectare. Hybrid rice accounts for about 57 percent of the total acreage, with an average output capacity of 7.2 tons per hectare, according to Yuan's presentation. "The average yield of hybrid rice is at least 20 percent more than that of inbred rice, feeding 70 million more Chinese people annually," Yuan said. "If 50 percent of the world's rice paddies were planted with hybrids, rice production could increase by another 150 million tons, and 400 to 500 million more people could be fed." Statistics from the United Nations show that about 1 billion people are suffering from hunger and malnutrition. Every six seconds, a child dies of hunger or related diseases. Yuan's consistent contribution to the country has won him wide respect in China. Many people have sent him wishes of health and longevity through the Internet since August. "He fed one-fifth of the world's population. If he applied for patents, he might be the richest man in China, but he never did it and is still living a simple life," reads a post at Sina.com, one of the country's most popular web portals. Premier Wen Jiabao also wrote to Yuan on Monday to congratulate him on his birthday, in which Wen said Yuan's extraordinary accomplishments not only belong to China, but also exert influence on the world.